The following families have genealogy eBooks on this page: Aborn, Allerton, Babbitt, Belding, Coates, Coollidge, Faxon, Fulham, Haverfield, Henry, Jepson, Koiner, Mead, Munroe, Willcomb, and Wyer families. 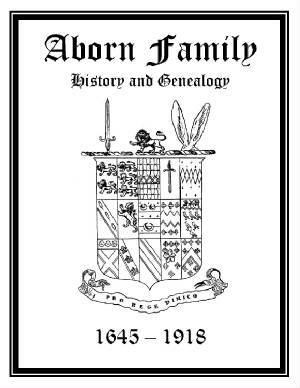 Aborn Family History and Genealogy. PDF eBook English 0.77 MB. 1918. Although more current names and dates range from the year 1645 up to 1918, if you accept the historic statement that both William the Conqueror and Marmion were 6th generation descendants, from their common ancestor Rollo in the year 860, then this author can trace his ancestry for thirty-two generations over a space of 1058 years! Although only 13 pages in length this resource is packed with genealogical information and Aborn family lore! Fascinating! Price $6.95 USD. 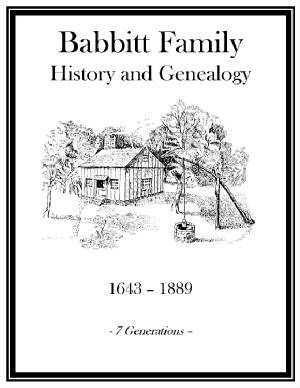 Babbitt Family History and Genealogy. PDF eBook English 0.62 MB 1889. Edward Bobit, an immigrant from Wales settled in Taunton in about 1643. He married Sarah Tarne, and they had 9 children. Edward was killed by the Indians in 1676, but his family lived on! There is 7 generations listed stretching 246 years from 1643 up to 1889. Although only 7 pages in length, this family resource includes a historical insight into the legacy of a great American colonial family. It should be remembered, and that’s why it’s here. Price $6.95 USD. Coates Family History and Genealogy. PDF eBook English 16.6 MB 1906. Moses and Susana (Welden) Coates were married at Cashel, Ireland, in 1715. their descendants are traced through eight generations. The book contains an account of the journey of Isaac Coates, of Caln, to The Indian Country in 1799; extracts from the journal of travels of Sarah Coates in 1836; and poems of Elmer Ruan Coates who died in 1889. Vital names and dates extend from 1717 to 1906 with family lore reaching back to the year 1331. Illustrated by 25 portraits and 17 views of residences. 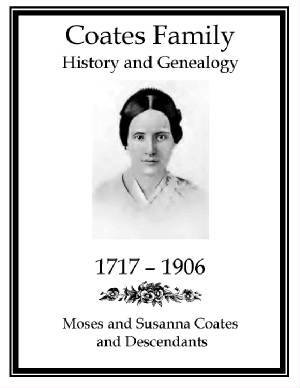 An essential resource for the Coates family genealogist! Price $6.95 USD. 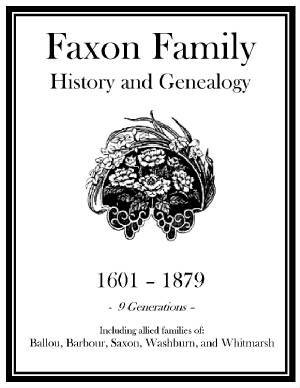 Faxon Family History and Genealogy. PDF eBook English 16.9 MB. 1879. Thomas Faxon emigrated from England to America before 1647 with his wife Joane and three children. Names and dates range from the year 1601 to 1879 with 9 generations of descendants, deeds, wills, and a map locating the homesteads of the first four generations. This is a treasure of information for the Faxon family genealogist! Price $6.95 USD. Haverfield Family History and Genealogy PDF English 12.8 MB 1919. After a slow, and tedious, correspondence lasting 7 years this in depth family history is intertwined with the establishment of the Ohio Territory. The kinship of Haberfield is also noted along with poetry and letters. Vital names and dates range from 1774 up to 1919 with a 28 page index listing over a thousand names of descendants and in-laws. 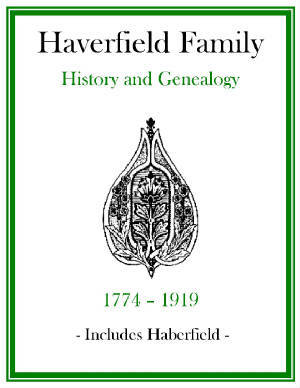 A fantastic resource for the Haverfield or Haberfield family genealogist! Price $6.95 USD. 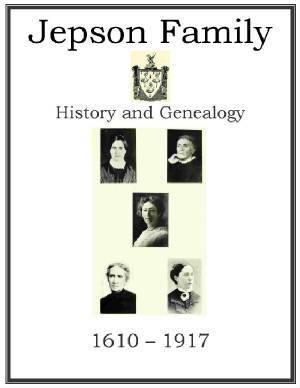 Jepson Family History and Genealogy PDF eBook English 8.33 MB 1917. Jeppesen, Jepsen, Jipson, or Jippson. Nine years in the making this well articulated reference spans 307 years, form 1610 to 1917, with vital dates and names of ancestors and in-laws. The name is derived from a given name meaning Jeffs Son. The Family Coat of Arms is discussed in detail, and family lore is presented which extends back beyond the year 1475. A source of abundant information for the family genealogist! Price $6.95 USD. 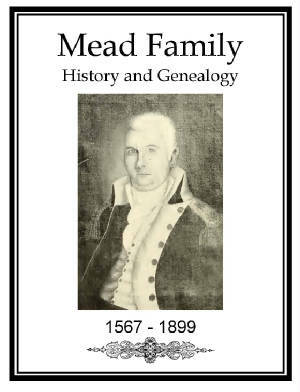 Mead Family History and Genealogy PDF eBook English 8.03 MB 1902. This publication provides fresh insight on individual family accomplishments in past centuries. There are well written biographies on many Mead forefathers, which span a period of over 300 years! Detailed accounts of Mead family members in all major United States wars up to 1898 is well articulated, along with vital names and dates ranging from the year 1567 up to 1899. A great source of history and genealogy on one of Americas long standing Colonial families! Price $6.95 USD. 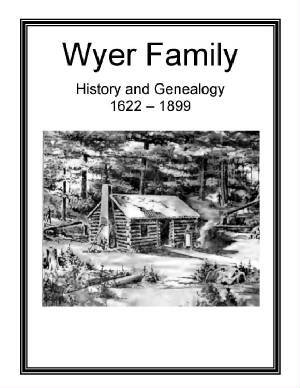 Wyer Family History and Genealogy. PDF eBook English 2.71 MB. 1900. Another painstakingly hand typed publication on an old Remington typewriter accomplished over 100 years ago! There are 9 generations documented, which begin with Edward Wyer, a tailor, in the New World over 380 years ago. Compiled statistics for family descendants extend from 1622 up until 1899! Price $6.95 USD. Allerton Family History and Genealogy. PDF eBook English 7.41 MB. 1900. The Allerton family in the United States from the year 1585 up to 1885, and in particular a genealogy of the descendants of Isaac Allerton, a pilgrim of Plimouth, Massachusetts. 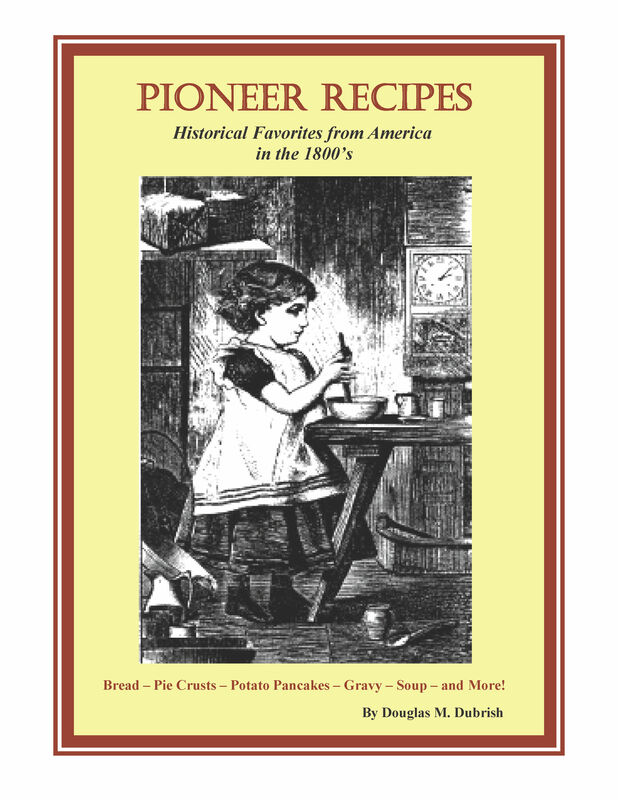 Three hundred years of history with a detailed account featuring short biographies on many Allerton ancestors, rare ancestral photo’s, and over 15 pages of indexed names with more than 500 people listed! 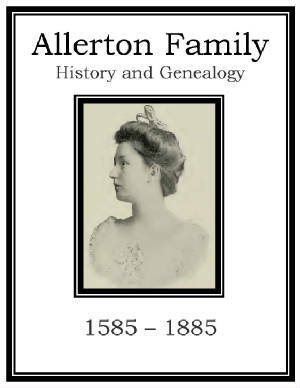 An essential resource for the Allerton family genealogist! Price $6.95 USD. 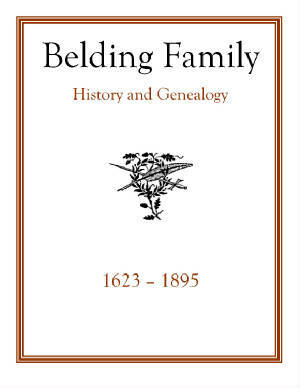 Belding Family History and Genealogy. PDF eBook English 1.07 MB 1896. From Staffordshire, England, the family was one of the earliest settlers of Wethersfield, Connecticut. Vital dates and names range from 1623 up to 1895 with 10 generations listed! Many tidbits of family lore can be found on the 20 pages of this centuries old genealogy that may not be found elsewhere! A great link to the past! Price $6.95 USD. 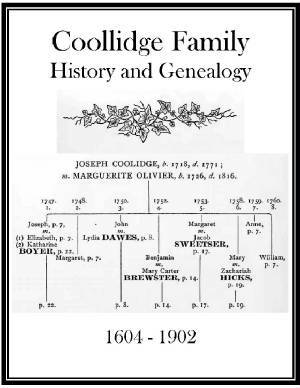 Coollidge Family History and Genealogy PDF eBook English 2.79 MB. 1903. John Coollidge was in Watertown, Massachusetts when smallpox broke out among the natives in Ontario and started to work its way south toward the new colonies in 1630. Vital names and dates of descendants stretch from 1604 up to 1902 with many ancestral charts in this wonderful 59 page resource. A great source of kindred households that can extend the Coolidge or Coollidge genealogy back for decades! Price $6.95 USD. 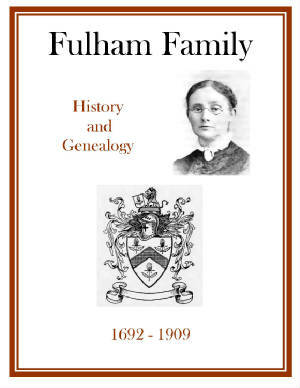 Fulham Family History and Genealogy PDF eBook English 23.8 MB. 1910. Outstanding short biographies with adventures of forefathers taking place before, during, and after the American Civil War. There are many ancestral photographs with 7 generations that stretch from 1692 up to the year 1909. This well written publication includes family lore that dates back to 631 A.D. This is a wealth of information for the Fulham family genealogist! Price $6.95 USD. Henry Family History and Genealogy PDF eBook English 12.3 MB 1915. 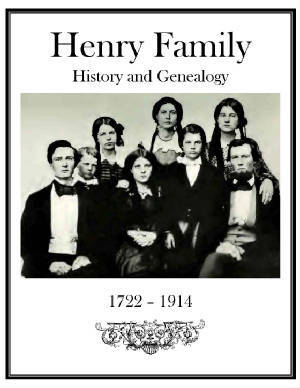 Henry ancestors from 1722 to 1914, with many family branches, are documented in this great resource along with a 26 page index listing several thousand descendants and in-laws. Numerous rare ancestral photographs, and poetry accompany the story featuring the pioneer Samuel Henry of Hadley and Amherst, Massachusetts, back into the early 1700s. A step back in time with a great link to Henry history! Price $6.95 USD. 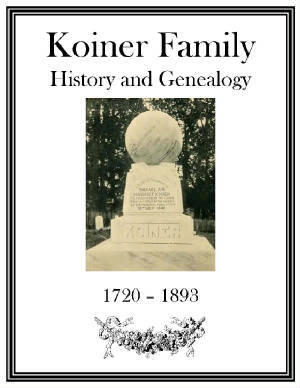 Koiner Family History and Genealogy PDF eBook English 9.98 MB 1893. In the first generation documentation shows Michael and Margaret Keinadt, with the surnamed beginning to change in 1773 yet used up until about 1827. Detailed history of the family origins in Europe with 173 years of vital dates and names, ranging from 1720 to 1893, are included along with delightful poetry! A source of important documentation to extend the family genealogy! Price $6.95 USD. 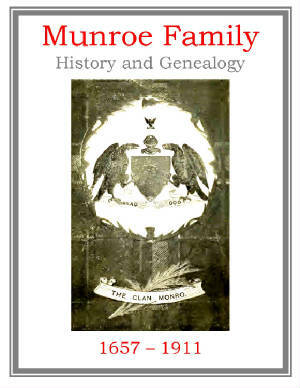 Munroe Family History and Genealogy PDF eBook English 20.2 MB 1912. After the Battle of Worchester in Britain on September 3, 1651, thousands of Scottish prisoners were sold as slaves to the American Planters in New England. An outstanding account of the Scottish history accompanies the names and dates of descendants and in-laws from the year 1657 up to 1911. Ancient family lore extends back through the ages to 990 A.D. with a description of the Munroe tartan and other fascinating details of the family legacy! A must have for the Munroe family genealogist! Price $6.95 USD. Willcomb Family History and Genealogy or Genealogy of the Willcomb Family of New England. PDF eBook English 11.3 MB 1902. 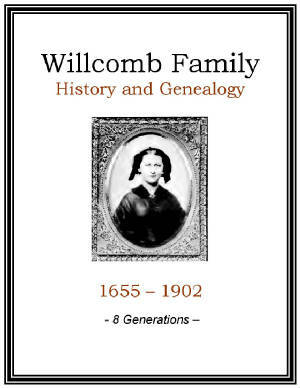 This is a very detailed account of the Willcomb family with essential information that spans nearly 250 years… from 1655 to 1902. It contains rare ancestral photographs, many sketches of descendants, silhouette portraits, Last Will and Testament, a rare ancestral timeline and much more! There are 8 generations with over 400 indexed names! A great source of family genealogy! Price $6.95 USD.